Last week, I posted about a new pair of socks that I had started knitting. One sock is now complete. The yarn is Regia Blitz Color in Colorway 02527. It has been fun to watch the color patterns change as the stitch count varies. 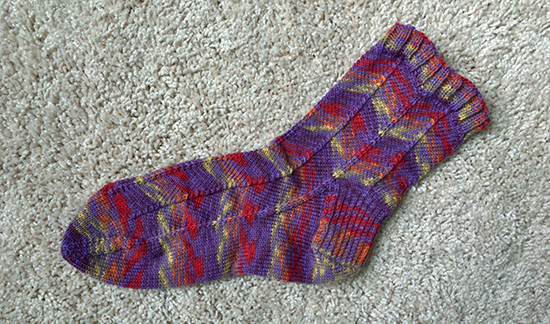 The pattern is Jaywalker by Grumperina. Now that I’m halfway through the project, I understand why this is a popular pattern. It’s easy to remember, and it creates a pretty sock. For sizing, the pattern suggestion is to choose a circumference that is the same as or smaller than the foot. The smallest size, 76 stitches, is supposed to fit most women’s feet. Even though my foot size fits within the parameters for the smallest size, I chose the next size up, 84 stitches, based on past sock knitting experience. I like the fit of the sock as I knit it; indeed, I think that if I went smaller I would struggle to get the sock past my heel due to the pattern’s lack of stretch. That said, I understand why Grumperina suggests a tighter fit. The zigzags exert a strong pull on the fabric. I like the effect at the cuff of the sock, which is shifted into its own subtle zigzag. The same effect, however, is also evident along the top of the foot. Between the bend at the ankle and the straight stitches at the toe, those zigzags have nowhere else to go but up in a series of ripples. A tighter fit would pull the zigzags flat against the foot. 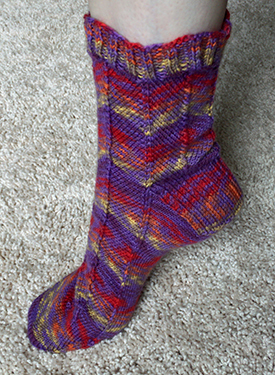 If I make these socks again, I'll use a sock yarn that has elastic in it. I think that would achieve the correct fit at 76 stitches while offering enough stretch to get the socks on and off easily. I haven’t tried the first sock on with shoes yet — I’d rather wait until both socks are complete — but I don’t think the ripples will translate to bunching that makes the socks unwearable. The combination of the cheery colors and the dynamic pattern will definitely make this a pair of socks I wear often, with or without shoes. On a different note, Tour de Fleece started on this past Saturday. I won’t be participating this year because of the simple fact that I haven’t unpacked my spinning supplies yet. I found the spindles last night, but have yet to locate the fiber. If you're spinning for Tour de Fleece, please share a link to your blog or social media in the comments so we can follow your progress. I hope you all have a safe and happy 4th of July!